BROADCAST HOURS ON FRIDAY AND SATURDAYS NIGHTS STARTING BETWEEN 6PM AND 8PM CST TILL MIDNIGHT CST. CHECK BACK LATER IF IT IS NOT RUNNING YET. I FORGET ABOUT THE TIME SOMETIMES. I moved back to my parents house with my own living quarters in the basement with a 25 foot telescopic mast in the back yard attached to the closeline pole and guyed with 3 wires. The ground plane VHF/UHF scanner antenna is at 20 feet and then the rotor and the little TV antenna for my FM Stereo radio stations and the 2 Meter ham radio 5 element beam antenna. 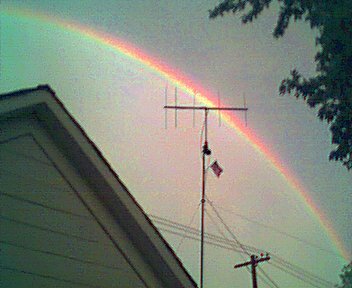 I also have an alternate 15ft mast next to the house for lightweight antennas, such as my dipole CB antenna, and in the future a ARX2-B from Cushcraft. The reception isn't as great as on top of the apartment house I lived at for a year, but I got a neat setup in the back yard. I am using my Uniden Bearcat 248CLT base scanner with a homemade scanner dipole antenna. The antenna is mounted beside the house about 12 feet off the ground. The antenna is has elements for VHF lo/hi and UHF. The typical range is about 10-20 miles and during signal propagation it's farther than that! I have my own phone line finally, so broadcasting isn't a problem. I'll try to announce ahead of time when I won't be broadcasting. BNSF 452.900 tower repeater from Olivet, Ks radio. It relays most areas between Kansas City and Emporia. note: my new location prevents me from getting the 452.900 tower link.